The new UK passport to be issued after Brexit will be made in France, the current British manufacturer has said. The boss of UK supplier De La Rue said it would appeal against the decision to award the £490m contract to Franco-Dutch firm Gemalto. De la Rue’s shares closed nearly 6% lower on Thursday. Pro-Brexit former cabinet minister Priti Patel said the decision to hand the new contract to a foreign firm was “disgraceful” and “perverse”. The Liberal Democrats’ Brexit spokesman, Tom Brake, said the “blue passport saga” was becoming a farce. However, it added that passports did not have to be made in the UK and 20% of blank passport books are currently produced in Europe. It also said the new deal could save the taxpayer £100m-£120m and that 70 new jobs would be created in the UK, at sites in Fareham and Heywood in Lancashire. 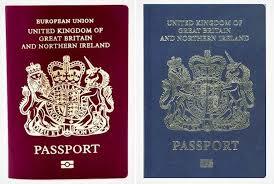 Earlier, De La Rue boss Martin Sutherland told the BBC’s Today programme:”Over the last few months we have heard ministers happy to come on the media and talk about the new blue passport and the fact that it is an icon of British identity.